That rough patch included an understandable road loss to Whitman (20-1, 12-0 NWC), now the second-ranked team in the d3hoops.com poll. But the loss at Willamette was much less expected. 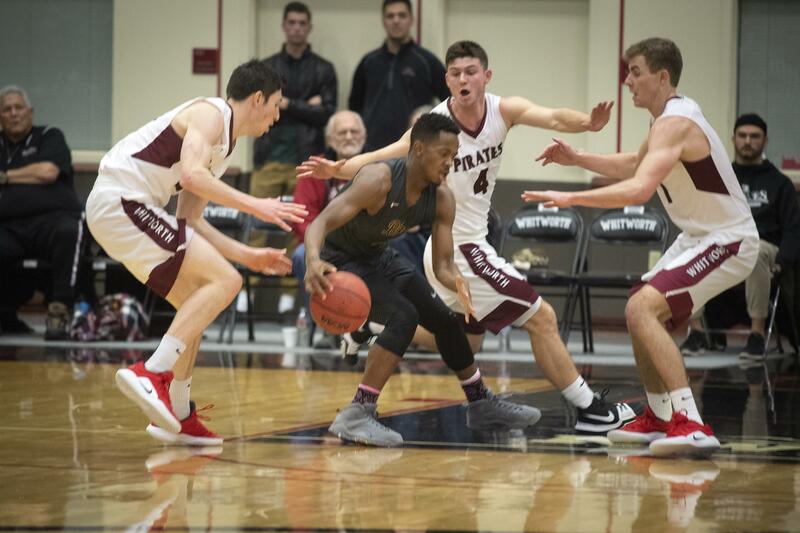 It was the first time the 15th-ranked Pirates (17-4, 9-3) had lost to the Bearcats (7-15, 4-9) in head coach Matt Logie’s eight seasons at Whitworth. Still, Logie said he saw some hopeful signs from his team in its most recent game, a home victory last Saturday against Lewis & Clark. The Pirates held the Pioneers to 1-of-10 shooting down the stretch as Whitworth erased a seven-point deficit to earn a 77-75 win. The Pirates face Linfield on Friday and George Fox on Saturday night with a chance to clinch the second seed in the NWC postseason tournament. They are a game ahead of Linfield and defeated the Wildcats on the road earlier this year. With four regular-season games remaining, two victories at the Fieldhouse would guarantee they would host a semifinal on Feb. 21. Linfield (15-6, 8-4) shoots well from the floor (50.9 percent) and from beyond the 3-point arc, where it has made 40.4 percent of its attempts. Making 3s is a formula that worked for Willamette, which sank 12 of 20 3-point attempts in its 95-93 win over Whitworth on Jan. 26. When the Wildcats lost to the Pirates 78-75 in mid-January, Linfield sank only 2 of 15 3-pointers. George Fox (12-9, 6-6) leads the conference in rebounding and boasts one of league’s best guard duos. Senior Mason Green-Richards and sophomore Ryan Lacey average a combined 36.3 points per game, including 38 in the Bruins’ 88-85 loss to the Pirates in January. Saturday’s game against the Bruins will be senior night for the Pirates, who will honor five. That includes starters Kyle Roach, Ben Bishop and Jared Christy, as well as sixth man Kevin Crosno and student assistant coach CJ Johnson, who played as a freshman and sophomore before injuries relegated him to coaching. Crosno and Christy, a Ferris High graduate who played at Pacific Lutheran, both transferred before their junior years, which was crucial for the program, Logie said. “We had lost a very large senior class and thought having some experience and maturity would be really important for us to not get too young too quick,” Logie said. The men’s games are scheduled to tip off at 8 p.m. Friday and 6 p.m. Saturday, each following women’s games between the same programs. Published: Feb. 7, 2019, 3:12 p.m. Updated: Feb. 7, 2019, 4:57 p.m.